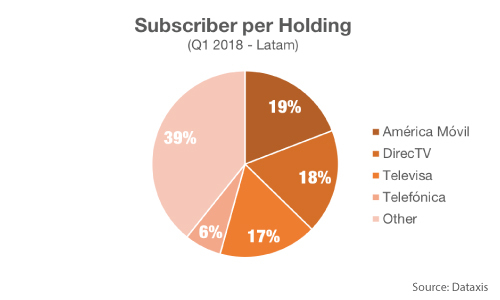 According to Dataxis, as at Q1 2018 Pay TV in Latin America reached 71.4 million subscribers, which represents a drop of around 0.1% compared to the end of 2017. Venezuela, Brazil and Mexico were the markets that recorded the highest loss of subscribers. 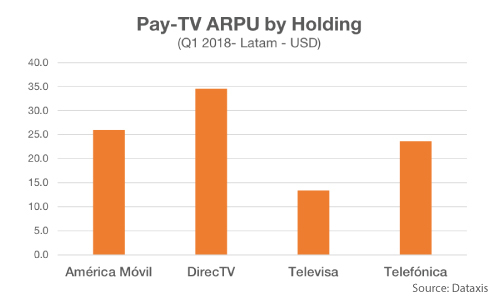 For the first quarter of 2018, América Móvil remained the main Pay TV group in Latin America in terms of subscribers. Although América Móvil held 19.2% of the subscribers, its dominance has declined due to the weight of Brazil in its portfolio. DirecTV, owned by AT & T, was the second operator measured for subscribers but the largest in terms of revenue. Televisa closed the podium with a good mass of subscribers but a very low ARPU. Although DTH met 48.7% of the subscribers, it was the technological option that was most affected by the reduction of subscriber base. Meanwhile, Cable and IPTV exhibited some progress.